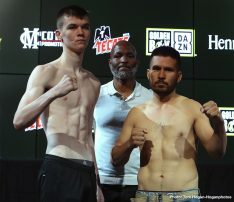 Antonio Orozco 142.4 vs Jose Rodriguez 138.6. 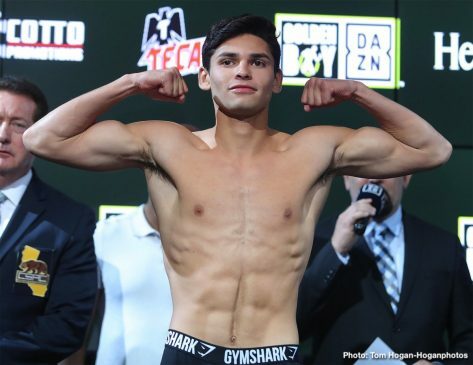 Popular lightweight prospect Ryan Garcia (17-0, 14 KOs) will look to inch closer to a world title opportunity when he returns against Jose “Wonder Boy” Lopez (20-3-1, 14 KOs) in a 10-round battle that will headline a stacked night of Golden Boy action. 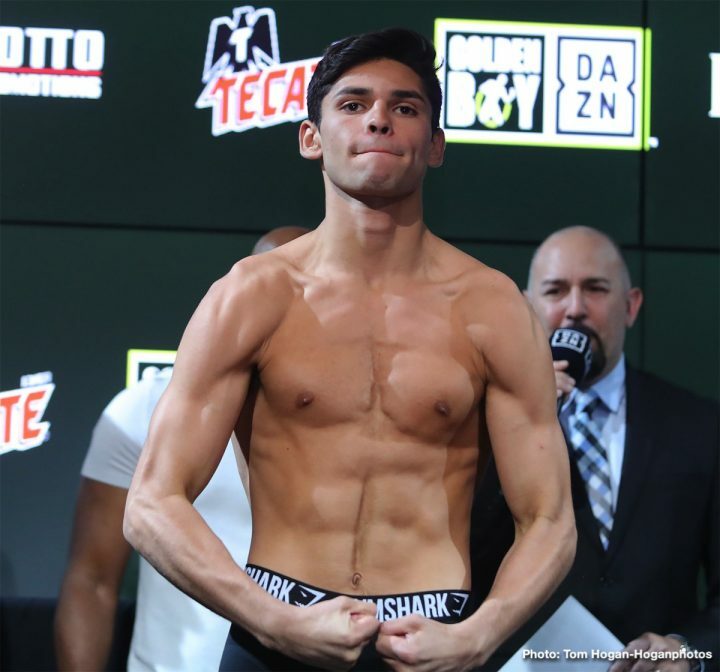 The event will take place on Saturday, March 30, 2019 at Fantasy Springs Resort Casino in Indio, Calif. and will be streamed live on DAZN . Garcia is a rising talent who had a spectacular year in 2018, fighting four times and earning the NABF and NABO Super Featherweight Titles. 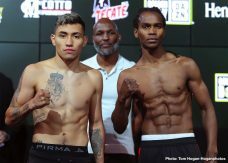 The 20-year-old native of Victorville, Calif. also made an important change to his stable, adding Eddy Reynoso as his head trainer before stopping Braulio “El Chavo” Rodriguez in his last bout. Garcia plans to demonstrate new skills as he seeks to earn a shot at a title. Lopez is a 24-year-old contender who has earned two regional titles since making his debut in September 2011. The native of Carolina, Puerto Rico has fought the likes of Jonathan “Polvo” Oquendo and Avery Sparrow. 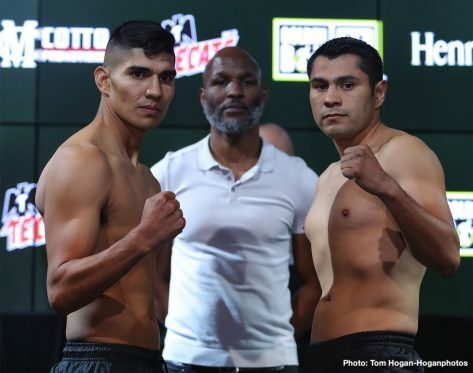 Lopez’s biggest win was against Miguel Angel “Miguelito” Gonzalez in April of last year, and he’ll look to prevent Garcia from becoming a big star in the sport. 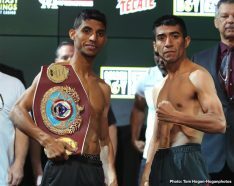 In the co-main event, hard-hitting Angel “Tito” Acosta (19-1, 19 KOs) of San Juan, Puerto Rico will defend his WBO Light Flyweight Title against Ganigan “El Maravilla” Lopez (35-8, 19 KOs) of Mexico City, Mexico in a 12-round battle. 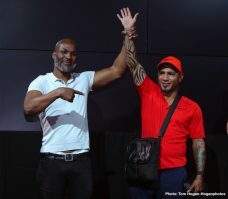 Acosta, who is part of a co-promotion with Miguel Cotto Promotions, is coming off a sensational first-round knockout win over Abraham “Choko” Rodriguez in October 2018. 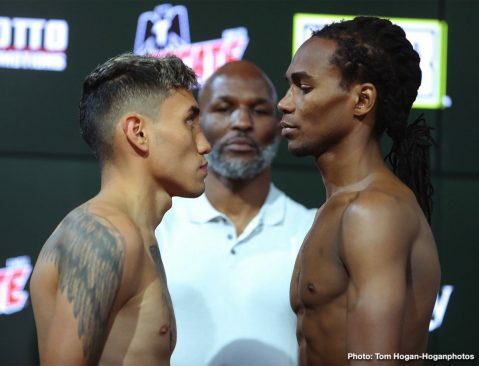 Rising super featherweight Eduardo “Rocky” Hernandez (27-0, 24 KOs) will make his debut in the United States when he takes on Ibrahim Class (22-5, 10 KOs) of Dar es Salaam, Tazania in a 10-round clash. 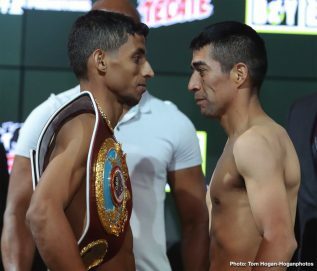 Hernandez is co-promoted by Promociones del Pueblo as Golden Boy looks to introduce yet another future Mexican star to an even larger audience. NABO Featherweight Champion Joet Gonzalez (21-0, 12 KOs) will defend his regional strap in a 10-round fight. 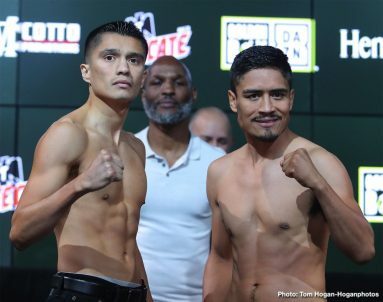 Antonio “Relentless” Orozco (27-1, 17 KOs) will return to the ring after his first world title opportunity in a 10-round super lightweight fight. Danielito Zorrilla (10-0, 8 KOs) of Rio Piedras, Puerto Rico will participate in an eight-round battle in the super lightweight division. 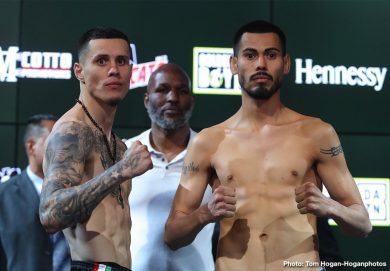 Neeco “The Rooster” Macias (17-1, 10 KOs) will look to bounce back from his first loss in an eight-round super lightweight fight. 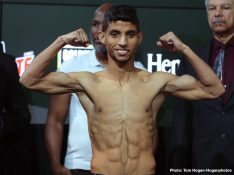 Herbert “Ace” Acevedo (15-2, 6 KOs) of Los Angeles, Calif. will fight in an eight-round 140-pound battle. Aaron “Silencer” McKenna (6-0, 4 KOS) of Monaghan, Ireland will return in a six-round welterweight fight against Loretto Olivas (3-0, 1 KO) of Santa Fe, New Mexico. Rommel Caballero (5-0, 4 KOs) of Coachella, Calif. will participate in a six-round super featherweight bout. Garcia vs. Lopez is a 10-round lightweight fight presented by Golden Boy Promotions and Miguel Cotto Promotions. The event is sponsored by Tecate, “THE OFFICIAL BEER OF BOXING” and Hennessy “Never Stop. Never Settle.” The event will take place Saturday, March 30, 2019 at Fantasy Springs Resort Casino in Indio, Calif. and will be streamed live exclusively on DAZN. Tickets for the event go on sale Friday, Feb. 22, 2019 at 10:00 a.m. PT and are priced at $35, $45 and $55. Tickets will be available at the Fantasy Springs Resort Casino box office, by calling 1-800-827-2946, or by purchasing online at www.fantasyspringsresort.com.